"The closest thing to it in popular rap in recent memory would be Kendrick Lamar's Good Kid, M.A.A.D. City. Just like Hamilton, GKMC is an album that requires time and attention, and rewards that investment handsomely." "...but this opener from the new cast recording makes the Founding Father come alive, with a bang." 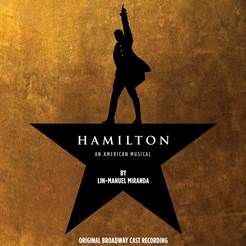 "HAMILTON (ORIGINAL BROADWAY CAST RECORDING)," Atlantic Records' official companion to the acclaimed new musical by Tony, GRAMMY® and Emmy Award-winner Lin-Manuel Miranda, has made a historic chart debut weeks before its official physical release. The album debuts on this week's Billboard charts at #1 on the "Top Broadway Albums" chart, #3 on the "Top Rap Albums" chart & #9 on the "Top Current Albums" chart. This impressive debut makes "HAMILTON (ORIGINAL BROADWAY CAST RECORDING)," the second biggest first week sales ever for a cast recording, behind only "RENT" in the Nielsen SoundScan era. What's more, "HAMILTON" debuted at #12 on Billboard's "Top 200," chart based on its strong album sales, track sales and over 2.1 million streams across all digital service providers. "HAMILTON (ORIGINAL BROADWAY CAST RECORDING)" is available now at digital retailers nationwide http://smarturl.it/HamiltonMusic & streaming via http://smarturl.it/HamiltonStream; the "HAMILTON (ORIGINAL BROADWAY CAST RECORDING)" 2-disc CD arrives in stores on Friday, October 16th. Produced by Alex Lacamoire, Bill Sherman, Lin-Manuel Miranda, and Ahmir "Questlove" Thompson & Tarik "Black Thought" Trotter, founding members of the GRAMMY®-winning hip-hop band, The Roots, "HAMILTON (ORIGINAL BROADWAY CAST RECORDING)" marks the first album to be mixed and mastered at the legendary Atlantic Records Studio in New York City. The physical album release of "HAMILTON (ORIGINAL BROADWAY CAST RECORDING)" will be celebrated on Friday, October 16th, with a very special event at New York City's Barnes & Noble (150 East 86th St. at Lexington Avenue). Slated for 3:30pm, the event will include a Q&A with Lin-Manuel Miranda moderated by Steven Sorrentino as well as a CD signing with the cast. Priority access to the event will be available to customers purchasing the "HAMILTON (ORIGINAL BROADWAY CAST RECORDING)" CD at Barnes & Noble. For more, please see https://stores.barnesandnoble.com/event/9780061726291-0. Now playing at Broadway's Richard Rodgers Theatre following a sold-out run at The Public Theater, HAMILTON features book, music and lyrics by Tony and GRAMMY® Award-winning composer Lin-Manuel Miranda (IN THE HEIGHTS), who also plays the title role. The musical is directed by Thomas Kail, with choreography by Andy Blankenbuehler and music direction and orchestrations by Alex Lacamoire. HAMILTON is inspired by Ron Chernow's biography, "Alexander Hamilton." Lin Manuel-Miranda and the cast of HAMILTON have received coverage from notable major publications including cover stories in Billboard, The Hollywood Reporter and T Magazine, along with prominent features in Vogue, Cosmopolitan, and Rolling Stone to name a few, all of which has added to the HAMILTON phenomenon. HAMILTON is the acclaimed new musical about the scrappy young immigrant Alexander Hamilton, the $10 Founding Father who forever changed America with his revolutionary ideas and actions. During his life cut too short, he served as George Washington's chief aide, was the first Treasury Secretary, a loving husband and father, despised by his fellow Founding Fathers, and shot to death by Aaron Burr in their legendary duel. HAMILTON has received unprecedented critical acclaim since its Off-Broadway debut at the Public Theater earlier this year. "Historic," declared the New York Times' Ben Brantley. "This is a show that aims impossibly high and hits its target. It's probably not possible to top the adrenaline rush." "HAMILTON is the most exciting and significant musical of the decade," wrote the Wall Street Journal's Terry Teachout. "Sensationally potent and theatrically vital, it is plugged straight into the wall socket of contemporary music." "Rooted in hip-hop, but also encompassing R&B, jazz, pop, Tin Pan Alley, and the choral strains of contemporary Broadway, the show is an achievement of historical and cultural reimagining," noted The New Yorker's Rebecca Mead, while Vulture's Jesse Green wrote, "HAMILTON not only incorporates newish-to-Broadway song forms, it requires and advances them, in the process opening up new territory for exploitation. It's the musical theater, not just American history, that gets refurbished," adding, "Let's not call HAMILTON groundbreaking. Let's call it, with hope for the future, historic." HAMILTON has been feted with a long list of major theatrical honors, including 10 Lucille Lortel Awards, eight Drama Desk Awards, three Outer Critics Circle Awards, the 2015 New York Drama Critics Circle Award for "Best Musical," and the prestigious 2015 Obie Award for "Best New American Theatre Work." In addition, HAMILTON has been seen by some of today's most important public figures, from President Barack Obama (who attended with daughters Malia and Sasha), Vice President Joe Biden, Treasury Secretary Jack Lew, and Bill, Hillary, and Chelsea Clinton to superstars spanning Robert De Niro, Jerry Seinfeld, Anna Wintour, Julia Roberts, Paul McCartney, Busta Rhymes, Helen Mirren, Tom Hanks, Lena Dunham, Madonna, Roger Federer, Katy Perry, and Marc Jacobs. For current ticket availability, please see hamiltonbroadway.com/#tickets.